Caroline Myss invites you to experience the music that has taken her to "mystical altitudes": the soaring voices of the acclaimed Bellissima Opera. 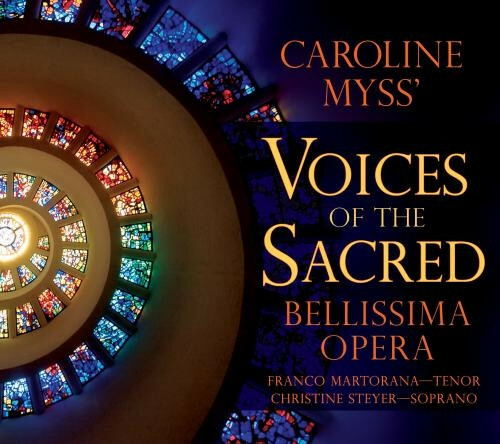 With inspiring performances chosen by Myss herself, Caroline Myss's Voices of the Sacred will elevate you to the heights of presence and grace. A chance encounter led Caroline to discover Bellissima Opera, an internationally renowned ensemble whose mission is to introduce new audiences to the hidden spiritual dimensions of great opera and classical music. Now she shares her 16 favorite selections—sung by these uplifting voices and accompanied by piano or organ—to spiral your spirit upward into the divine strata. Ah...what inspirational music... so many wonderful classics on one CD. Just learned to sing Ave Verum, so hearing it performed here was wonderful! If you like classical music or opera then buy this cd. I love Ave Maria and never get sick of hearing it.